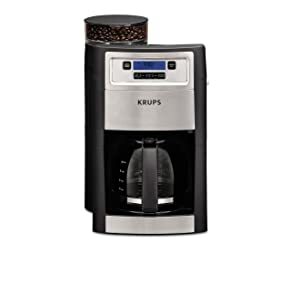 For coffee lovers who appreciate both robust flavor and convenience, a popular coffee maker style now gives anyone the ability to go from whole beans to cup with just one machine. Most coffee connoisseurs do prefer to grind their own beans, which allows one to brew a more fresh and flavorful pot. Coffee makers with grinders make this a quicker, simpler process – what’s not to love? Each of the machines we’ve reviewed will be able to grind coffee from whole beans directly on the coffee maker. This is done by pouring the beans into a hopper, then operating the integrated grinder unit. How the actual grinding process takes place differs slightly. Grinders come in two types – blade and burr. Blade grinders grind the beans by using a shaving action on the hard beans, which provides a smoother grind and mellower taste. Burr grinders, in contrast, crush the beans, allowing for more oils and flavor to reach the brewing compartment. Your flavor preference will help you determine which type of grinder will work best for you. All of the coffee makers we’ve reviewed use the drip process to brew. Water is added to a reservoir and is heated. The hot water then drips over the ground coffee, extracting oils and flavor, and pours into the carafe below. The end result is your fresh cup of java goodness. Although the coffee is made in the same general way, there are a dizzying variety of coffee maker features to consider, from pot size to carafe type to programming features and customizable settings. We review all of these for you, allowing you to make the most informed choice. Here are our suggestions! The Grind and Brew is a powerhouse for the coffee-loving household. Featuring one of the largest capacities of all the makers we reviewed, at 12 cups, it makes a lot of coffee for serious coffee drinkers. On the other hand, it will also make a smaller batch just as well, using the 2-4 cup feature integrated into the unit. Once done, it keeps your coffee warm for several hours in its double-walled stainless steel thermal carafe – no hot plate needed. For the household or office that needs coffee throughout the day, this is an excellent choice. Another nice feature of this type of carafe is portability. With reviewers reporting that the coffee stays hot and drinkable for up to 7 hours, this is the perfect carafe to pack up and take to your morning soccer games or meetings. A click and seal lid aids portability. For ease of use, the unit is fully programmable, with a clock feature. Start times can be set for up to 24 hours in advance. And, there’s no need to worry about leaving it on – when the pot is finished, the machine turns off, as well. The grinder’s hopper can hold up to whole 8 oz. of whole beans, and can also be sealed tightly until they are needed. The burr style grinder can be adjusted to be finer or coarser, and the coffee strength can be set from Mild to Strong, which gives the versatility to make a blend to please everyone. Pre-ground coffee can also be used, with the flip of a switch. A brew pause feature allows a cup to be poured while the carafe is still filling. The fact that the unit has no hot plate means no burned coffee, and also saves electricity. A replaceable charcoal water filter ensures smoother coffee, and the metal coffee filter is removable and easy to clean. The Grind and Brew is approximately 16 inches high, 11 inches deep, and 7.5 inches wide. The three-year warranty guarantees many problem-free pots of coffee. Points to consider: Some reviewers noted that the grinder on this machine was particularly loud and that the carafe, while durable, was difficult to pour from. A few reviewers commented that this maker made tasty coffee, but the brewing process could take up to 15 minutes for a full 12 cup pot. The Magnifica, from Italian company DeLonghi, looks impressive and has features that will appeal to anyone looking to hone their barista skills at home. This machine gives you control and precision and has automated many of the steps for you. Using a professional quality burr grinder, the grind fineness can be adjusted to suit. Also adjustable are water and coffee quantities. This feature allows you to make your espressos as strong as you’d like. Tall – short – this unit can make them all, as well as coffee, espresso, latte drinks, and cappuccinos. The controls are simple and intuitive. The highly programmable features include the ability to save preferences, such as strength and size, from one brewing session to the next. Several reviewers raved about the Magnifica’s consistency in producing the perfect cups at the perfect temperature. With a 60-ounce water reservoir, this adds up to a lot of cups! The entire machine measures 17 by 13 by 18 inches. A convenient feature allows you to remove the boiler unit, water reservoir, and coffee grounds without moving the entire machine. At 22 pounds, this is a thoughtful touch. A decalcification indicator reminds when it’s ready to run the cleaning and rinsing program, which makes other maintenance a breeze. The machine also alerts you when the water is low, and when the grounds need to be emptied. The patented frother system efficiently mixes milk and steam for a rich froth and can be adjusted to create rich and creamy lattes. A nice feature of the machine is the ability of the user to operate all the functions and steps from the front of the unit. There is a separate compartment that can be filled with ground coffee, as well. Reviewers mention that this is a nice way to have decaffeinated coffee available to guests. When making more than two cups, the maker has an instant reheat function, the Rapid Cappuccino System. This prevents waiting time and provides hot, consistent coffee beverages on repeat. The cup tray keeps the cups warm while they’re waiting to be filled, adding to the coffee bar experience. A one year warranty and exclusive customer service line add to the appeal. Points to consider: The maximum cup height is 4.25 inches, and the manufacturers do not recommend using oilier coffee beans, as they are more likely to clog the grinder. If this is a personal preference, there are more forgiving machines available. With a higher price point, the Magnifica is an investment – but may save you money in the long run, if you can prepare your specialty coffee beverages at home every morning. The Coffee Team GS provides both a sleek look and a quick pot of coffee. Ideal for those who want to maintain the minimalist look on their kitchen countertops, this machine uses direct feed technology to keep the footprint small and the process quick. The burr grinder is adjustable to handle different types of coffee beans, from a coarser setting to be used for darker and oilier beans, to finer settings for light or medium roasts. The 6 oz. hopper feeds directly to the filter, and the water reservoir holds 20 oz, for repeated pots of coffee without the need for a refill. A charcoal water filter is replaceable and ensures that any tap water you use will produce a smooth coffee taste. The GoldTone filter is top-rack dishwasher safe and easy to clean. The CoffeeTeam also takes standard #4 paper filters. The fully programmable unit allows the user to select strength and other elements the night before, or up to 24 hours ahead. Start time, grind and brew settings can all be set in advance. This maker provides a quick grind, needing only about 7 seconds to prepare the beans for a lighter style brew. Reviewers praise the fact that the grinder unit is separate from the water compartment, which cuts down on steam and clogs. Another frequently mentioned plus is that the unit is easy to clean. You also have the ability to select from 2-10 cups when brewing. The grinder adjusts automatically and will dispense just the right amount of ground beans. The handy brew pause feature allows a quick cup as the coffee brews. 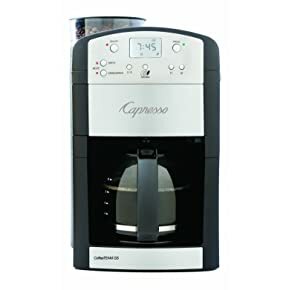 Capresso advertises that their coffee brews at approximately 200 degrees and reviewers agree it makes a fine cup of coffee, especially with the adjustable “Aroma” settings that control darkness and flavor. With the warming plate designed to shut off after two hours, this unit prevents any worries about someone leaving the coffee machine on. The unit measures a compact 9.25 x 9.25 x 15.25 and is stainless steel and black plastic. A one year warranty is included. Points to consider: A somewhat smaller carafe than others reviewed. The unit’s larger water tank does use more energy to keep warm – this could be a concern for those watching their carbon footprint. This powerful unit combines technology and engineering to produce a ‘Bean to Espresso” cup in under a minute. Available in 3 color options: Red, Stainless or Black, the Barista Express is also quite stylish, giving a bit of sports car type flair to a kitchen. A sealed bean hopper holds up to a half pound of whole beans until they are needed. For those interested in exploring their inner artist, the unit has a microfoam steam wand that allows for creating latte art with ease. A warming cup tray also enhances the cafe experience. 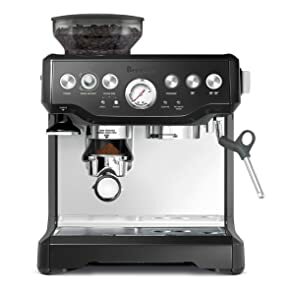 Thoughtful features for maintenance include a filter change reminder dial, an indicator light to remind when it’s time to clean the unit, and a system that presses excess water out of the coffee grounds to allow for an easier removal of the “puck”. Reviewers especially liked the latter feature, mentioning that it and the cleaning reminder light make for an easy cleaning experience. A full array of accessories include a stainless steel milk jug, single and double wall filter units, and a cleaning kit. 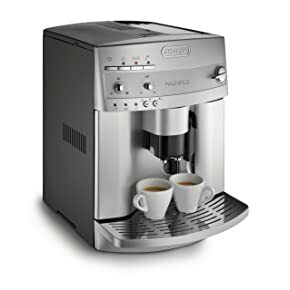 In addition to fast cups of espresso or other coffee drinks, the fact that the machine boasts an on-demand hot water feature gives instant access to hot water for tea drinkers – a feature mentioned frequently by reviewers. Room for filling extra tall cups and a one year warranty round out some of the thoughtful features of this unit, which measures 13.2 x 12.5 x 15.8 inches. Points to consider: With all the automation of features on this machine, it still requires the user to tamp the ground coffee before brewing. Replacement water filter costs were frequently mentioned as a “con” by reviewers. This is an easy to use machine with a simple interface, providing a generous 10 cups of coffee whenever you need it. The entire unit provides many of the new customizable features of other coffee makers, without being intimidating. The stainless and black unit has a narrow footprint on the kitchen countertop, and the glass carafe has a wide comfortable handle and easy return to the hot plate. The curved spout is easy to pour from. An adjustable stay-warm feature keeps each pot of coffee hot for up to 2 hours without worries, and auto-programming allows you to wake up to a freshly ground pot. Reviewers consistently give high scores for the simple design of the buttons, which make this machine particularly easy to use. The machine, although easy to operate, has a lot of custom options for the owner. The burr grinder gives users a choice of 5 settings from coarse to fine, and the grinding unit and hopper can handle up to 5.3 oz. of whole beans. For further choices in your brew, there are 3 strength settings, including “Bold”. Each batch can be set for 2-10 cups. The coffee maker also works with pre-ground coffee, by pressing the “Grind Off” button before brewing. The handy “brew pause” feature means that a quick cup can be poured before the entire carafe has filled. Reviewers also liked that the machine is designed to keep the steam from the brewing process away from the grinding unit, keeping it easy to clean. Ease of cleaning was often mentioned as a plus from the reviewers. The flat-bottomed gold metal filter is removable and washable, and the grinding unit is easily cleaned from the top of the unit with the included brush. The unit comes with a stainless steel and black plastic finish and measures 11.57 x 13.78 x 17.52 inches. Points to consider: This unit has no water filter, which may affect the final taste if using tap water for brewing. The coffee bean hopper is relatively small compared to comparable units. For those who just want a quick mug of coffee with the tasty convenience of freshly ground beans, the Mr. Coffee single cup system is a great solution. The unit comes with a generously sized stainless steel travel mug that fills directly from the machine. Just add the lid, and you’re out the door. It also allows for making a smaller cup of coffee, as the tray adjusts to fit smaller mugs. Ground coffee can also be used, simply by filling the filter basket. Reviewers have praised this model for being eco-conscious by cutting down on paper filter waste, K-cup use, and single serving disposable cups. Other positive comments mentioned that this model is a great item for college dorm rooms. The simple operation lets the user use the same cup or mug to fill the water reservoir, and then return it to the tray to be filled. Also easy is the two-button operation. Average grinding time is reported to be about 15 seconds, using a blade grinding system. The direct-to-mug preparation system is splash free and quick, cutting down on total time getting out the door in the morning. Other nice features for the busy person are a removable grinder and filter unit that is dishwasher safe, just like the drip tray and drip tray plate. The permanent filter is durable metal mesh. The travel mug is also dishwasher safe and is double-walled and BPA free. The entire unit measures only 14x6x10 inches, is sleek and attractive in stainless steel and black plastic, and comes with a one year warranty. Points to consider: It’s easy to forget to bring your travel mug home, canceling out some of the convenience factors. Some reviewers find the metal filter basket to be messy. 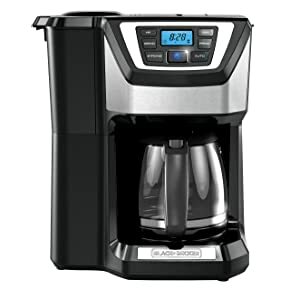 This model combines both brewing capacity and features in a well-priced unit. Fully programmable, it can start the morning batch of coffee on its own, or wait for you to decide on when to begin brewing. The 12 cup capacity is one of the largest reviewed, but the machine can be set to make anywhere from 4-12 cups. The unit comes in a nice range of colors: gray, black, red and white – suitable for any kitchen. style. This machine is also designed to be easy to clean. The metal coffee filter and integrated grinder, as well as the showerhead, can all be lifted out and washed in the top rack of the dishwasher. The warming plate is also non-stick and wipes clean. The blade grinder is adjustable for the optimal grind and is fully integrated into the machine design, allowing for a lower profile. The beans are added via a pull-out door on the side of the unit. Ground coffee can also be used by turning off the grinder function. The coffee output can be set for 3 different brew strengths. 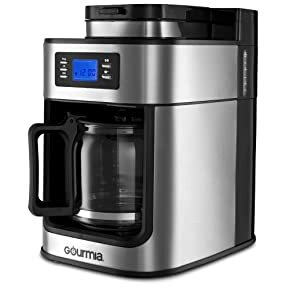 Other features include a variable keep warm setting that can be adjusted for anywhere up to 120 minutes, an auto shut-off function that turns the unit off after the keep warm period, and a handy fresh brew timer that indicates how long it has been since the coffee finished brewing. The “Sneak A Cup” feature pauses the brewing process to allow for pouring a quick cup. Reviewers consistently mention that this maker makes a robust pot of coffee and is easy to clean. The interface includes a digital clock and backlighting on the setting functions. A two-year warranty adds to the value. The finish is available in a selection of colors and black, and the unit measures 13 x 10 x 16 inches. Points to consider: Some reviewers have noted that the glass carafe breaks easily. No water filter can be a problem in households with hard or heavily chlorinated tap water. The sleek looking model is stainless steel and occupies a slim 11.5 x 7.5 x 12 inches on the countertop. The 10 cup carafe is quite adequate for multiple coffee drinkers. For the busy owner, the machine’s 40-minute automatic shut-off feature gives peace of mind, and the easy operation is aided by the permanent metal coffee filter. When it’s time to clean, the entire basket, grinder and brewing chamber can be lifted out, and are dishwasher safe. The unit is programmable and features simple, 2 button controls so that one can wake to freshly ground hot coffee. The hopper is a nice size and holds enough beans to make 5-10 cups of coffee before the need for a refill. This machine will also use your ground coffee if you’re out of whole beans. The entire coffee maker is lightweight and can be easily tucked under cabinets when not in use, and reviewers note that it can be quickly stored away in a cabinet for those who don’t drink coffee on a regular basis. Reviewers generally agree that the Gourmia produces a very hot and flavorful cup of coffee with minimal fuss. The ability to make from 2-10 cups of coffee was also popular. The neutral design assures that it will go with any type of kitchen decor, and several reviewers commented on the machine’s good looks and easy operation. This machine offers an attractive price point and makes a nice housewarming gift for someone who is just getting their first apartment. Points to consider: Some reviewers have noted that the clock’s military time setting can be confusing and makes for a more difficult programming experience. The blade grinder can be louder than comparable units. Consider how many cups of coffee you will need to make on a typical day. If you prefer just one perfect cup of espresso, you might want to spring for one of the more customizable espresso/coffee units. Think about the type of bean you enjoy using. Some of the more intense beans are oilier, and not all units deal well with grinding them. The type of water you use for your coffee can be important. If you use tap water that is hard or heavily chlorinated, a unit with a charcoal filter can really enhance your brewing experience. If your lifestyle is hectic, consider a unit that offers easy-clean features such as the removable grinder and filter units that can be run through a dishwasher. Even the most sophisticated machine will still require periodic maintenance to keep performing at its best. Whether you use a note on your calendar or the machine’s own reminder to you, make sure you decalcify your coffee maker regularly. Your owner’s manual will provide instructions on how to undertake this task. Likewise, make sure you check and maintain your grinder burrs or blades by removing ground coffee residue. If you prefer a stronger bean with more oils, this will need to be done more often. Don’t store your whole beans in the freezer or refrigerator. Although some believe this keeps them fresher, they are porous and readily soak up moisture and flavors from other items they are stored with. Q: Why are metal coffee filters so popular? A: Although paper filters are easy and convenient, fine mesh metal filters offer a simpler alternative, and, some say, a smoother brew. All of our reviewed machines feature the metal filter, which can be reused indefinitely and is easily cleaned in the sink or the top rack of the dishwasher. They’re good for the environment, too! Q: Can I still use ground coffee in my grind and brew type coffee maker? A: Yes! 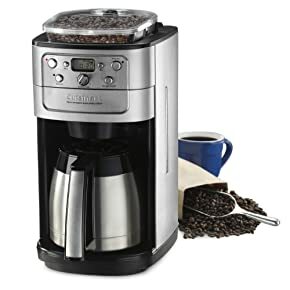 If you’ve run out of whole beans, or just want to try a coffee flavor that is already ground, all the coffee makers reviewed will work just as well with pre-ground coffee. Simply add the ground coffee directly to the coffee filter basket, following the directions in your machine’s manual, and brew. Q: What is the best way to clean the coffee grinder on my unit? A: Some units feature a removable grinder that can be lifted out and washed in the sink or dishwasher. Others will have a fully integrated grinder that is cleaned without removing it. These will require gentle brushing to remove any coffee bean residue and keep the grinding mechanism performing at its best. As always, follow the recommendations in your owner’s manual. Q: I hate technology, and all these machines say they are programmable. Do I have to program it every time I want a cup of coffee? A: Although auto program features are very popular, any of the machines listed above will allow you to start the process without any additional programming. Simply add the beans and begin the grinding and brewing process. In this way, they will work just like older coffee makers. Most homes need a coffee maker. With built-in grinders now available, you may want to consider a new model with this feature, especially if you love restaurant style beverages. Once you’ve decided on the convenience of grinding and brewing on the same machine, you’ll want to evaluate the many choices. More sophisticated programming, thermal carafes that keep coffee longer, brew pause buttons for a quick cup, and even custom strength brews, are just some of the options that are available. Selecting the coffee maker for your home can be decided by evaluating your coffee drinking preferences and then finding the unit that has the features that are the most important to you. Special features like the ability to create latte style beverages or instant cups will help you choose your most perfect coffee maker. Do you want your coffee to have the best flavor? Would you like to simplify your kitchen appliances? Try one of the above coffee makers with grinders and you’ll be feeling like a barista – and saving time, too.